HOBOKEN, N.J. – Bijou Properties, a developer widely recognized for successfully redeveloping urban properties and a leader in the field of “Green” development along the Gold Coast, announced that its new Park Place mixed-use building currently under construction in Hoboken, NJ has received a 2013 Smart Growth Gold Award from the Hudson County Planning Board. The new 12-story building, located at 1415 Park Avenue on the north end of Hoboken, will feature 212 rental residences, 13,000 square feet of retail space, 32,000 square feet of educational space and a six level parking garage. The $131-million project is being developed in partnership with the AFL-CIO Building Investment Trust (BIT) and Tishman Construction, and was designed by Marchetto Higgins Stieve. The award was presented to Bijou Properties during the 4th annual Smart Growth Awards ceremony on June 19th. Park Place was chosen from a field of candidates judged on site selection, site design and proposed green infrastructure criteria from a number of sources, including the American Planning Association, The U.S. Green Building Council (USGBC) and NJ Future. Bijou Properties will pursue LEED Gold Certification from the USGBC for the building. 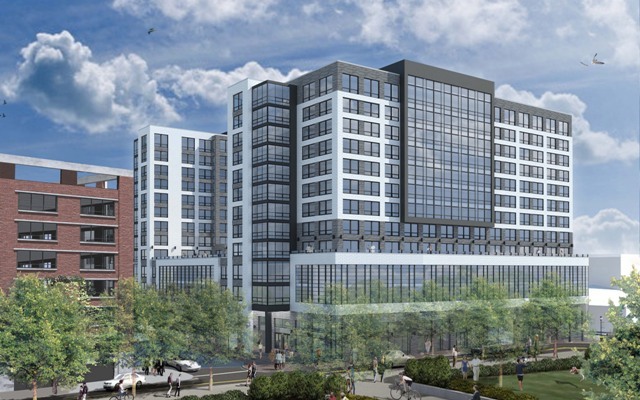 On pace to be Bijou Properties’ third LEED-certified building in Hoboken, Park Place will include a number of innovative, environmentally-sensitive features to minimize its impact on the environment. These include a vegetated roof terrace that will reduce storm water runoff, a CHP (combined heat and power) module that produces hot water and electricity using a single natural gas fuel source, twelve charging bays for electric cars and spaces for more than 100 bicycles. The heating, cooling, and lighting designs, in conjunction with a high performance building envelope and the CHP module, aim to achieve a 20% reduction in energy usage based on industry standard comparisons. 100% of the usable concrete from the demolition of the previous parking garage that occupied the site was processed onsite and diverted from landfills. The processed concrete was used as back-fill, in turn, minimizing traffic from trucks on and off the site. Residences will include energy-conscience features such as Energy-star appliances, low-flow fixtures and zero voc paints. Founded in 1999 in Hoboken NJ, Bijou Properties designs, develops & manages the highest quality sustainable buildings and has become a recognized leader in the field of green development along the Hudson Waterfront. Recent projects include Garden Street Lofts (NJ’s First LEED Gold Residential Highrise), The Hostess Factory, a 42,000 square-foot retail restoration including a 20,000 square-foot Green Roof; and Edge Lofts, a Midrise residential project at 1405 Clinton Street which is a candidate to receive the first NJ LEED Residential for Homes Platinum designation. Beyond its individual properties, Bijou Properties is focused on creating better neighborhoods and healthier environments for the community at large. More information can be found on the company website: www.bijouproperties.com.